Jon likes to lead from the rear. He believes an atmosphere of freedom in the workplace creates the healthiest environment for work. Staff need to be free to make their own decisions, as long as the end goal of serving the customer to the best of our ability remains. Jon, born and raised in Auckland, New Zealand in the same house in a suburb called Titirangi, the last town you pass through to the now popular surf beach near Auckland, Piha. When it came to a high school, he and his parents chose one on the far side of this vast city, so they decided upon him attending boarding school. During his 4 year stay at boarding school he learnt the skills of living and studying together with the full range of personalities that a large boarding school brings. After getting his driving licence at the age of 15, his last year of school was spent driving one and a half hours each way to his school on the other side of town in a Ford Anglia, his first introduction to cars. The car below is not the actual car, but it is an Anglia. After graduating from St Kentigern High School in Auckland it was down to Christchurch to do a degree in Horticultural Science as well as teaching qualifications for New Zealand high schools. On top of that he took TEFL qualifications in Australia for teaching English as a foreign language in places like Japan. In his second year at university the Ford Anglia was written off (by Jon) in an accident. 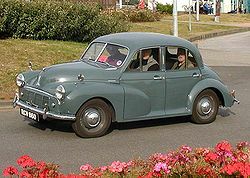 It was then replaced by an even older Morris Minor that had an “automatic opening passenger door” that opened by itself when turning right. The below car is a similar car with the split windscreen. The best place in the world for teaching English in 1990 was Japan, so Jon left the modest shores of New Zealand and started his teaching life in Osaka, Japan. On his trip to Japan, as well as returning to New Zealand on holidays, he noticed most of the other passengers were car dealers and private New Zealand citizens gong to Japan to buy cars. Even the hosts and hostesses on the planes were buying cars from Japan. This must have been a good market to create such interest. After teaching for 5 years Jon began to get restless to do something a little more challenging. Now married to his wife Takako and with 2 young daughters in tow, he embarked on “importing” a classical car, a Morris Mini, from New Zealand to Japan in partnership with another New Zealand teacher friend. They made the mistake of repainting the car in New Zealand into a different colour (British racing green), thinking that would be more popular (rule one of classical cars “ORIGINALITY” reigns). Now came the first experience with trade. A “bill of lading” was sent to him in Japan to clear the vehicle. At first he thought they had made a mistake with the wording, surely it should be a “bill of LOADING“? They were ripe rookies ready for harvest. One “kind” company offered to clear the car through customs and give the car a “pre-registration status” so that it could be driven. 250,000yen later (real commission should have been 50,000yen) the car was on the road with a number plate and a driver (Jon himself). It was a simple one hour drive, mid-Japanese summer. Road temperatures around 55°C and a 1966 Morris Mini does not have an air conditioner, just a natural heater coming from the engine. At the traffic lights he would jump out of the car trying to cool down. A very long story cut, the car was eventually sold at cost to a dealer who looked at it in the night and expressed his dismay that it had been repainted a different colour. 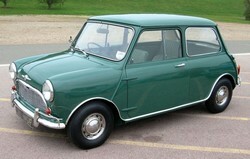 The car below was probably an original British racing green, but with a repaint, it looked just like it. Soon after this experience, a small dealer in Wellington, New Zealand, contacted Jon and expressed a desire for someone to “purchase cars from the auction” for him. Jon contacted a dealer with memberships in the Kansai area auctions and Provide Cars Ltd started. So did the huge learning curve about cars. Little did he know that under the back seat of a 1990 Nissan Terano would be rust. Little did he know that a 2.4L Toyota hilux surf was a bad engine had it not been serviced, nor that a manual turbo 2.0 litre skyline would be so expensive. Add onto this the learning curve in documentation for export. The learning curve in documentation for deregistering a car for export. The endless paperwork and guarantors needed for membership in the auctions. Still, the curves were learnt and the mid-1990’s was the boom time for exporters, as people from around the world flocked to Japan to buy up these cheap cars, SUVs and trucks that the Japanese economy was churning out. The Irish market was booming, the English market was opening, the New Zealand market was growing, the Australian market had loop holes in it to allow vehicles in, Cyprus, Africa! As Jon became familiar with the vehicles he was purchasing and the whole export process, he began to realize short falls in the way he was operating. He was limited to the number of vehicles he could view for his customers. A customer would be requesting a Toyota Landcruiser in a certain colour and condition, for example, but it was just not available in the auctions he was visiting. It WAS however, available at auctions elsewhere in Japan. By only covering a small percentage of the vehicles available each day in Japan, he was doing his customers a disservice. And Japan is all about service. Through the brilliance of a very talented programmer, a homepage was developed that began to make available, every vehicle on sale in the Japanese car auctions each day. From there the company grew. Jon likes to spend his spare time with family of 4 children and wife. Doing something in nature is what he likes the most. Whether it be swimming or diving around beaches. Tramping or walking through the endless New Zealand walking tracks. But some of the Japanese culture has brushed off into his play. There is nothing more satisfying at the end of a hard day than going to a Japanese hot bath, and eating a healthy Japanese meal! Previous PostAfter a year of buying through the auctions rather than dealers stock! Look what happens!